I’m spending Friday AM cruising south to MCAS Cherry Point, N.C., where I’m to take a noon hop out to the Wasp to begin Navy Times’ coverage of a certain gi-normous amphibious training exercise you may have heard of by now. Bold Alligator is the biggest Navy-Marine Corps at-sea training exercise in some 10 years. Wasp is sort of the exercise mothership, so that’s where we’ll get our senior leader interviews and exercise briefings. 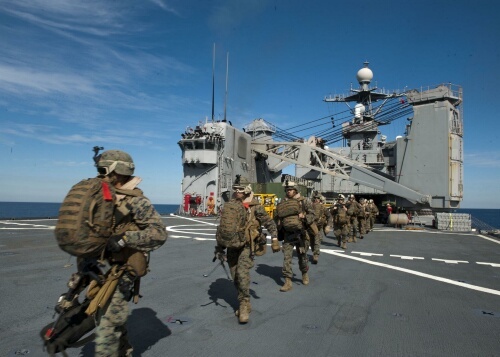 On Saturday, I’m slated to fly over to Kearsarge and begin covering the training itself, as the Navy-Marine Corps team prepares to launch an amphibious assault that will take place sometime over the following few days. Connectivity at sea can be dicey, as many of you know. I’ll do my best to keep you posted on the goings-on here and on our web site. Meanwhile, looks like a Super Bowl XLVI party at sea. The last time I watched the Super Bowl away from someone’s living room, I was in a tent with an Army air defense artillery unit outside Dhahran, Saudi Arabia, where the air strikes for the first Gulf War were underway; the launch of the huge armored assault and the famous “left hook” was three weeks away. The Giants won that one 20-19 when the Bills’ Scott Norwood missed a last-second field goal wide right. Who are you picking this Sunday? Seems to me the Giants are rolling at the right time.